Another player who will miss the Atlantic League playoffs after helping Somerset to a first-half title has been relishing an opportunity with Pawtucket, not only because he is within one step of getting back to the majors but also since he has been on the team with his cousin. When outfielder Chris Marrero joined the PawSox he was assigned a locker only two away from shortstop Deven Marrero, only recently promoted to the major league Red Sox. "To play with my idol and someone I've looked up to ever since I was born is amazing," Deven Marrero told The Providence Journal. "I've always wanted to be like him. To have him here is awesome and (to) live our dream together is pretty cool." 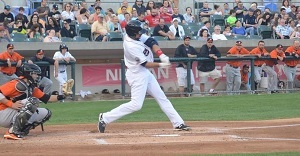 Chris Marrero, 27, and two years older than his cousin, hit .277 with seven homers and 29 RBI in 70 games for Pawtucket.